Disembarking the various ferries that service the British Virgin Islands daily, visitors arriving through the Road Town Ferry Terminal are welcomed by the putrid stench of what can be confused with rotting eggs, raw sewerage, or a filthy fish market. But, actually, the offensive odour emanates from the seasonal sargassum seaweed decomposing around the recently refurbished ferry terminal. And while most visitors have a momentary encounter with the foul-smelling seaweed, Customs and Immigration Officers based at the Road Town dock are made to function under the stench for full workdays. Residents who utilise the dock, as well as passers-by and those in immediately surrounding areas are also affected by the smell. The matter has now attracted the attention of some local officials. “As a commuter, I’m assaulted by it each morning,” said Director of Tourism Sharon Flax-Brutus while speaking with BVI News on Tuesday. The tourism director said the foul-smelling seaweed is also a problem for ferry operators who have reported a similar issue at the Beef Island port. “While we appreciate that it’s a natural phenomenon, at times, nature needs some help. So, we will continue to reach out to the relevant agencies for some solution,” she said. 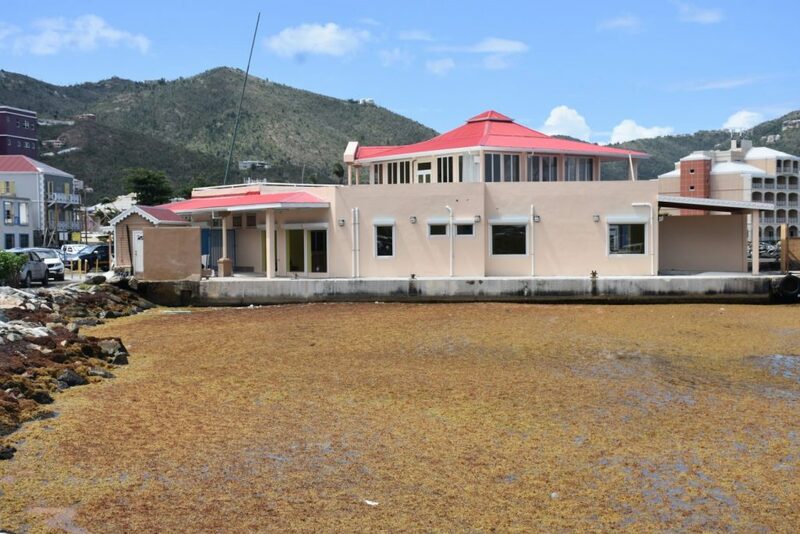 When contacted about the stink, Acting Managing Director at the BVI Ports Authority Akeem Pickering told BVI News his organisation was ‘working on it’. “We already have a plan in place to begin the cleaning,” he said. Pickering did not give any timeline when the cleanup will begin and declined to speak further on the issue. Sargassum, a brown floating seaweed, is a marine alga that originates from the Sargasso Sea, which is a region in the Gyre of the North Atlantic Ocean. Over the years, the seasonal seaweed has been the cause of a number of challenges throughout the BVI. Some pre-hurricane challenges included widespread fish-kill, protracted disruption in water supply on Virgin Gorda, and temporary closure of the Dolphin Discovery attraction at Prospect Reef. Some have even described it as a territorial eyesore. Despite the plethora of negative impacts of sargassum, the seaweed is also known to provide a floating nursery for ample wildlife – similar to a mangrove system. It also helps to restore beaches and, in turn, creates greater coastal protection and storm resilience. This never used to happen before… been happening about 4-5 years now and don’t tell me it’s climate change. The good news is that the seaweed is a good plant fertilizer why don’t the Govt license a company who can make a product out of it and thus make it a condition of their trade license that they are responsible at the company’s expense for cleanup around the Territory and must do o within a certain period of it entering BVI waters – as a condition of the trade license. Makes so much sense it will never be done. So you think only BVI has sargassum? Surely if there was a business in collecting it someone would’ve already done it. Seaweed makes great fertiliser. It will come in handy when we are back to agriculture. Only when you wash the salt off it. Rain does that eventually if you bring it ashore but it smells while you wait and you have to lay it out thinly. This is a regional problem, but with the level of vitriol and odious parallels expressed you could be forgiven, if you thought it was intended mainly for our hapless tourists brazing the odds intending to pay us a visit. Between this and the circus tent at the west end we are clearly neglecting our tourism business. Who is in control? Who is managing this island? Where is the plan? Nobody is in control! Everyone is fighting for power and neglecting their duties to the people. We need someone that can Make BVI Great Again! We’ll give you Trump as a gesture of goodwill. Peg Leg location for eating. Without the ”Tent” there would no place for paying folk i.e. ”tourists” eat. I am sure this will cost one million dollars +. No, 5.5 mil to be exact, and the weed will continue floating on in! I don’t know where it comes from, but it looks like this is going to be a regular thing. I too would like to see some kind of plan from MNRL to address the issue. Somehow we need to collect it up and either barge it out to say or find a way to use it or dispose of it on land. The MNRL might as well be disbanded. What has that Minister done over the past few years? Perhaps we could dry it out and burn it on the permanent fire at Cox’s Heath. The fumes from the seaweed would make a nice change from the ones from paint, batteries, tires and plastics. That seaweed contains arsenic and would cause even more problems for the people breathing in those fumes if it’s burned down there. The seaweed does not contain anything dangerous. In fact, it’s a great fertilizer. Why not harvest it and give it to the farmers? Do we have any farmers? Isn’t farming the third leg to our economy? Now that our first leg got chopped off, farming must be the second leg to our economy. Do we have an economy? I thinks we only gots 1 leg left now. We know this already, but the question is who is paying to clean it up? WHO? Yes tell us who S. Flax Brutus, since you sit on BVIPA Board tell us what you are saying about paying to clean up this mess. Think you find its a global problem of eutrophication, caused by excess nutrients. 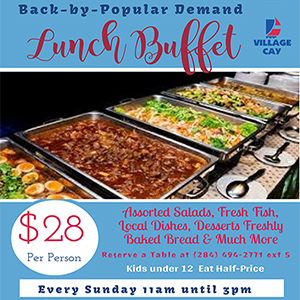 Considering BVI struggles with primary sewage treatment, there is no chance of tertiary treatment. That would remove the excess nutrient from waste stream that leads to excess algae growth. Other small island states suffer from the same problem. I don’t think the sargassum grows locally – it grows in mid Atlantic and drifts here where much of it is washed up on the shores of Caribbean islands (and much of it drifts past us all the way to Mexico). Let’s harvest it! Let’s kick start an agricultural business that can use it! This is nature trying to heal us. Great references! A must read for solutions to the problem. You were probably here working illegally as a visitor now coming writing piddle. Why were you denied further stay? It is pretty bad. Also some boats fill with diesel fumes. The two make for a rough commute. You Mad. Disney said NO. Lots of good ideas listed here, particularly regarding soil fertilizer. My idea is that it probably could be used at the garbage disposal site in cox heath. It may be good for the decaying process. This of course means they have NO PLAN. Research is being done on this messy Sargassum weed. Latest article is in the free/online http://www.caribbeancompass.com, April edition, which describes the issues and some ideas. December to May 2018, we sailed/cruised the BVIS and collected sargassum samples for the University of Southern Mississippi and University of South Florida, getting samples from Tortola and Sir Francis Drake Channel, plus the VIs, Antiqua, Dominica, Saba, and the Gulf Stream. Now waiting for samples to be studied for chemicals and composition. Scientists are working on helping the islands! It’s a shame visitors have to smell the weed upon arrival. It’s not a shame that the nasty and rude C&I officials have to smell it all day. They are just getting what they deserve for they way they treat tourists – the so called second leg of the economy. Milledge, J.J.; Harvey, P. Golden Tides: Problem or Golden Opportunity? The Valorisation of Sargassum from Beach Inundations. Journal of Marine Science and Engineering 2016, 4, 60. In recent years there have been massive inundations of pelagic Sargassum known as golden-tides on the beaches of the Caribbean, Gulf of Mexico and West Africa causing considerable damage to the local economy and environment. Commercial exploration of this biomass for food, fuel and pharmaceutical products could fund clean-up and offset the economic impact of these Golden-tides. This paper reviews the potential uses and obstacles for exploitation of pelagic Sargassum. Although, Sargassum has considerable potential as a source of biochemicals, feed, food, fertiliser and fuel, variable and undefined composition together with the possible presence of marine pollutants may make golden-tides unsuitable for food, nutraceuticals and pharmaceuticals and limit its use in feed and fertilisers. Discontinuous and unreliable supply of Sargassum, also presents considerable challenges. Low cost methods of preservation such as solar drying and ensiling may address the problem of discontinuity. The use of processes that can handle a variety of biological and waste feedstocks in addition to Sargassum is a solution to unreliable supply, and anaerobic digestion for the production of biogas is one such process. More research is need to characterise golden-tides and identify and develop commercial products and processes.